In our end-of-year blog post, we mentioned that Everlast Synthetic Products has exciting news on the horizon. In fact, we’re introducing a first for the seawall industry. In 2016, we’re releasing a true, patent pending vinyl seawall cap. Why is that so great? After prolonged exposure to saltwater and sun, traditional seawall caps corrode and expand, causing cracks to develop. As the cap breaks down, the seawall fails. But not so with synthetic materials. 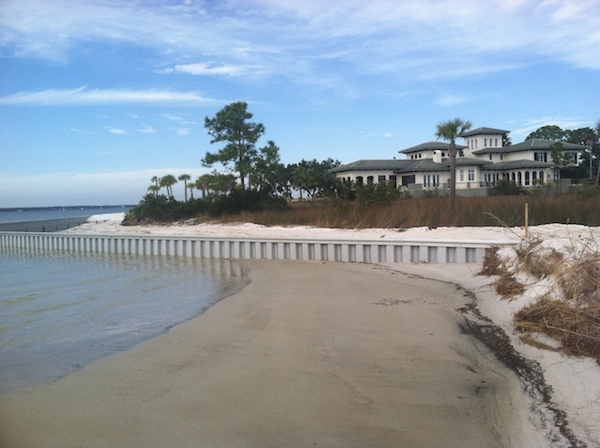 When considering a vinyl seawall, a few of our customers have been turned off by the pressure-treated cap option, knowing that over time, the cap could splinter, break down, and decay. A vinyl cap will enable the wall system to be a truly long-lasting and 100% synthetic solution. During seawall installation, contractors can easily install the patent pending Everlast vinyl cap on top of the wall, as it comes in standard lengths of 20’ sections. There is no need to spend thousands of extra dollars to have a concrete cap or even composite deck cap, and there are no maintenance requirements. Our patent pending vinyl cap is lightweight and easy to handle while offering a completely UV-stabilized, attractive finish with an anti-skid, slip-resistant finish. Vinyl works in almost all environments, but a vinyl cap especially benefits our customers in saltwater, where harsh marine environments are no match for a UV-stabilized cap. Although the cap works best with straight walls, it can easily be cut to accommodate some radiuses. Our patent pending vinyl cap also works nicely in freshwater applications where pressure treated caps are simply not a viable option. We’ll be releasing specifications and further details in the coming months, and we look forward to answering your questions about our innovative new product, our patent pending vinyl cap!